Mythic's Ultima Online may not have World of Warcraft's subscription figures, but it's still outlived multiple console generations. It may not be the world's first MMO, but Ultima Online still has a great many achievements to its name. It was the first MMORPG to reach 100,000 subscribers, an astounding number at the time. Ultima Online also popularized player versus player combat, a feature that quickly became a staple of online RPGs. But perhaps its greatest achievement is the simple fact that Ultima Online is still running a full 15 years since its launch in 1997, making it the longest running MMORPG ever. "I personally have worked on Ultima Online for more than 13 years," said producer Bonnie Armstrong, "and I'm still inspired by our players and actually learn something new from them every day. We truly have any amazing community who have been responsible for keeping the game alive for 15 years." Produced by Richard "Lord British" Garriott and set in the Ultima universe, Ultima Online and its eight expansion packs practically inspired the entire MMORPG genre. The game allows players to design characters using 58 skills and a wide range of occupations (including lumberjack!) before unleashing them into a massive fantasy-themed sandbox world. 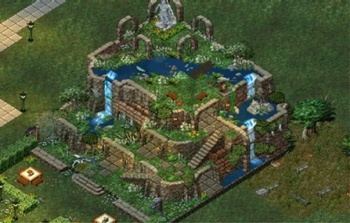 Ultima Online has even received seven Guinness World records, including first MMO expansion pack, first implementation of player housing, and even first in-game ecosystem. Ultima Online doesn't see the same kind of numbers today that World of Warcraft or League of Legends does, but what it has done is impressive nonetheless. The game has managed to survive three distinct console generations, not to mention my entire high school and college careers, all while enthralling its dedicated playerbase. In a marketplace where a brand new triple-A MMO still fails spectacularly, it's heartwarming to see that the achievements of Lord British and the Mythic team are standing the test of time.